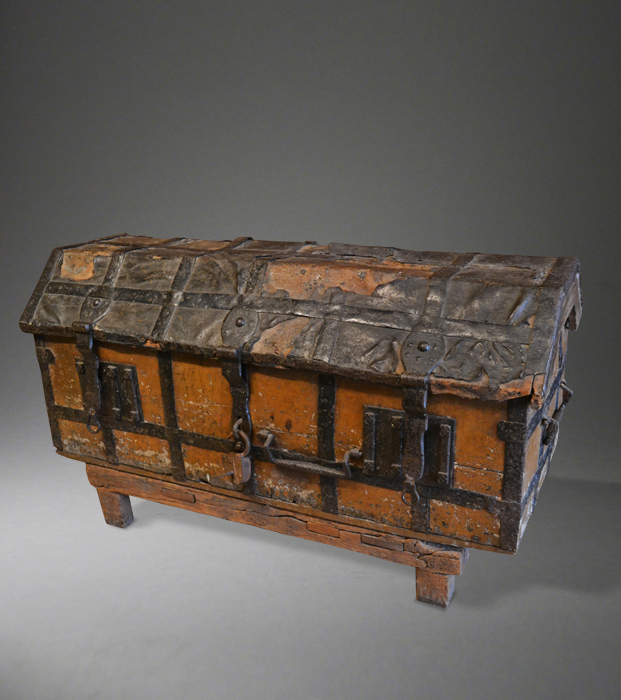 Just acquired from the private collection of a dealer, this wonderful chest dates from the early part of the 16th century and is in elm, covered with its original leather and sits on an oak stand. It is likely to have been a church chest and is virtually the pair to one that can be seen in Woodbridge Church in Suffolk. The canted lid is constructed from three planks and it has the same four iron bar carrying handles and three locks as the one in Woodbridge Church. Probably originally intended for church vestments, hence the protective leather covering, they were also used to house silver plate and documents. This one measures 56 1/2 inches long 23 1/2 inches deep x 22 1/2 inches high (30 1/2 inches including the stand). The price is £11750.